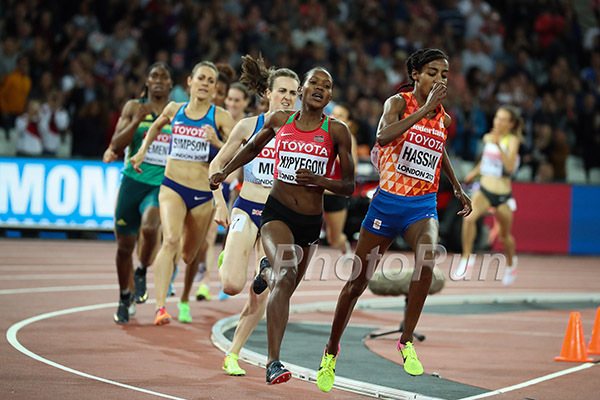 LONDON – Well, the bookies weren’t calling women’s 1500m final at the 2017 IAAF World Track and Field Championships the most wide open distance race for nothing. 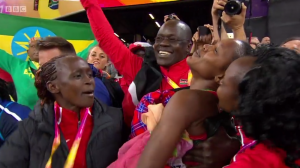 The race came down to a thrilling battle over the final 50 meters as what looked to be a duel for the win between Olympic champ Faith Kipyegon and world leader Sifan Hassan turned into a five-way dogfight for the medals. In the end, after the drama was over, the results in many ways ended up being similar to what happened at last year’s Olympics. 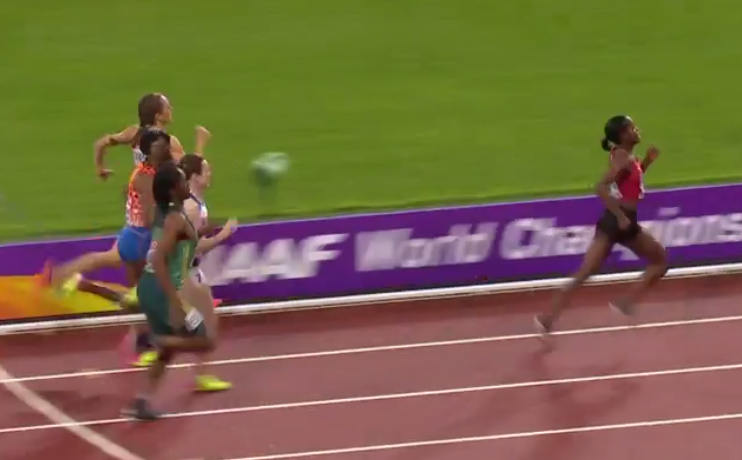 Once again, Kenya’s Faith Kipyegon was the winner of gold as she won in 4:02.59 thanks to a 58 flat lap. 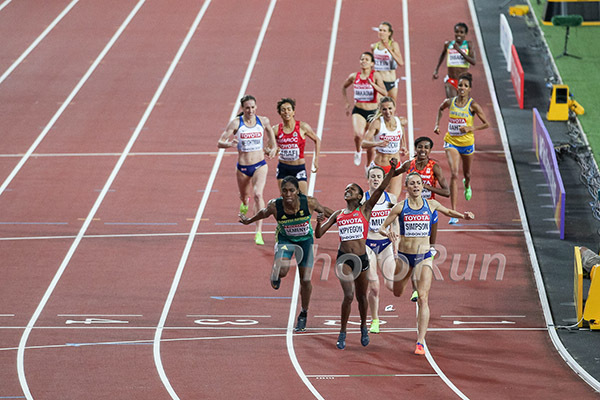 Once again, after measuring her effort to perfection, America’s Jenny Simpson had won a medal – her fourth in the last six global championships – as she moved up from bronze to silver (4:02.76). 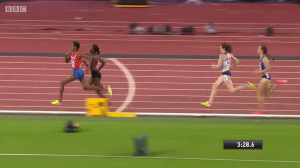 Once again Britain’s Laura Muir paid a steep price for going for gold and misjudging her effort as she was caught at the line by 800 star Caster Semenya (bronze 4:02.90) and left out of the medals by .07 (4th – 4:02.97). 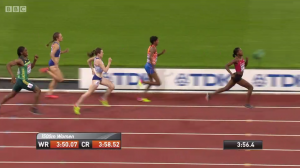 And once again, Sifan Hassan of the Netherlands had finished fifth (4:03.34), but this time in very cruel fashion as she was leading coming down the homestretch. 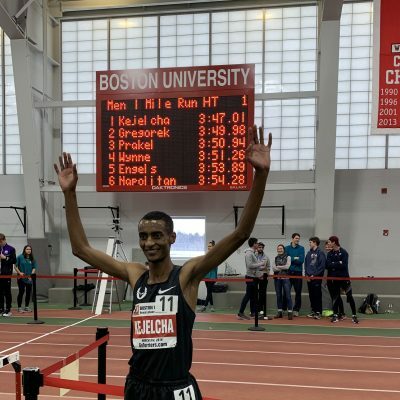 The biggest difference between this year and last — besides the addition of Semenya — was that world record holder Genzebe Dibaba, the 2016 Olympic silver medallist and world record holder, was a total nonfactor on the last lap and finished last in 4:06.72. The final lap, and particularly the final 100, were wild. Heading into the final 100, it appeared to be a two-person battle for gold between Kipyegon and the 2017 world leader Hassan as they had 3-4 meters on Muir, who in turn had about 5 meters on Simpson, but both Hassan and Kipyegon had misjudged things. 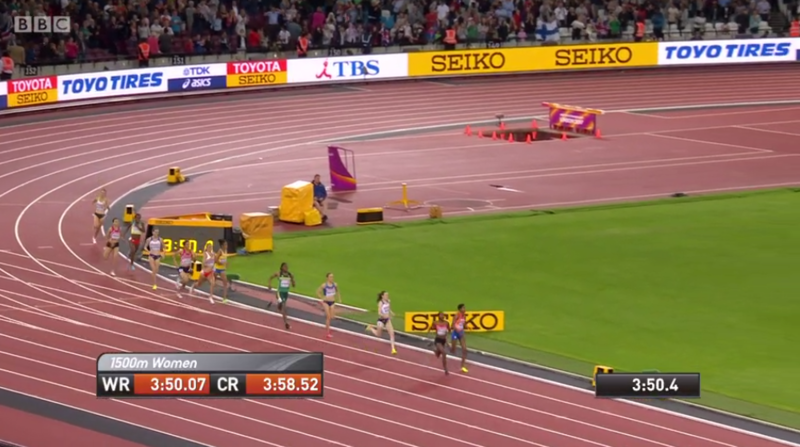 They had run the first 200 of the final lap in a ridiculous 28.2 and were both slowing down. Kipyegon managed to hold on to win thanks to a 29.8 close but Hassan cratered and went from second to fifth in the final 30 meters. 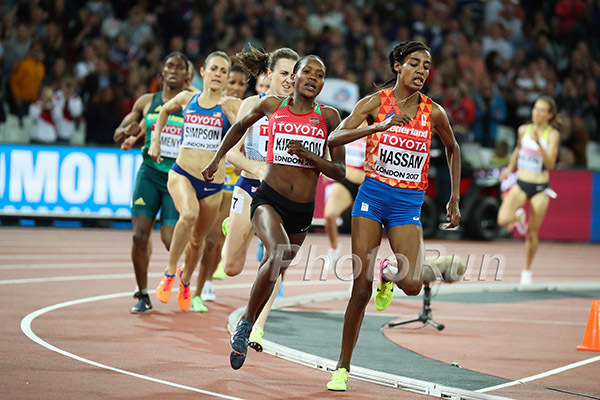 In addition to cratering, Hassan also had made the cardinal sin of leaving the rail, and as a result, Simpson was able to go from fourth to second with an inside pass on the rail in the final 25 meters of the race. 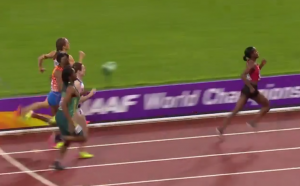 The person with the best close of all was Semenya, who was moving up like a freight train over the final 100. 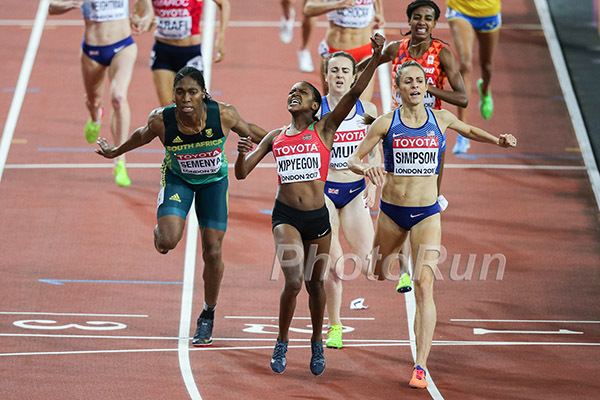 Thanks to a final 300 of 43.04, which was by far the fastest of anyone in the field (Simpson’s 43.6 was 2nd best), Semenya was able to go from 9th at 1200 to third at the finish as she nipped Muir just before the line. 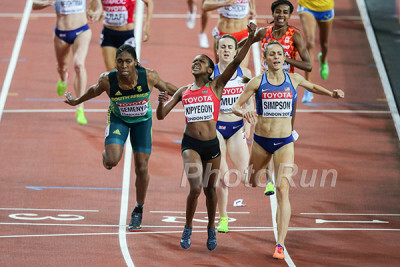 Kipyegon afterwards said she knew she had to make a move before the final straight or Caster Semenya would beat her. That’s exactly what she did and she barely made it to the finish line, but most importantly she made it there before everyone else. 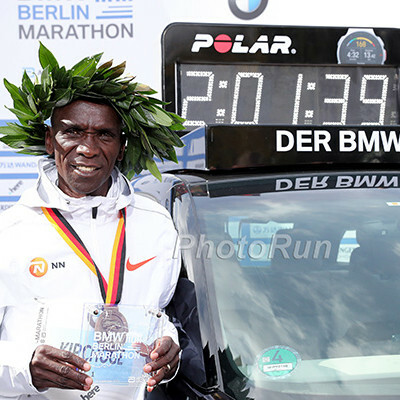 Kipyegon felt some pressure as the Olympic champ but got the job done versus a great field. “It was a strong field today because we were all strong and I had faith I was going to do it.” Fitting words for someone named Faith. 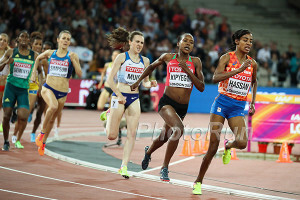 Just 23, it will be interesting to see how many more global titles Kipyegon will rack up in her career. With her win today, she joins Algerian Hassiba Boulmerka as the only woman to ever have won both an Olympic and World title in the 1500. Boulmerka won Worlds in 1991 and 1995 and the Olympics in 1992. Winning global titles is something Kipyegon is quite good at as she also won World Youth (2011) and Junior titles (2012) as a teenager. 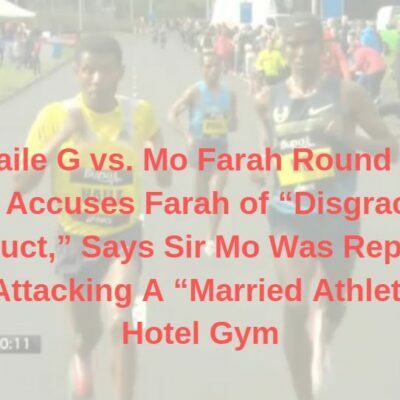 (Editor’s note: Maryam Jamal won Worlds in 2007 and 2009 and in London 2012 crossed the finish line third but the two people ahead of her have been DQ’d due to doping. Jamal has never officially been upgraded to gold). Simpson probably held that title before this race was even run, but tonight’s race was a perfect example of what makes her great: she ran a smart, patient race and got the absolute most of her body to take silver. Simpson is certainly very fit, but so was the rest of the field. 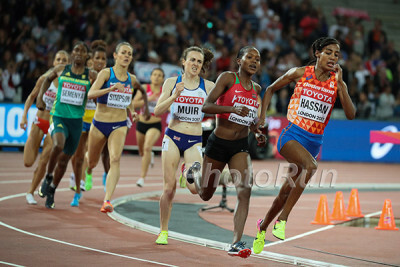 Hassan has run 3:56 twice this year and Muir beat Simpson convincingly the last time they raced each other in London on July 9, but both women made hard moves that they ultimately could not sustain. 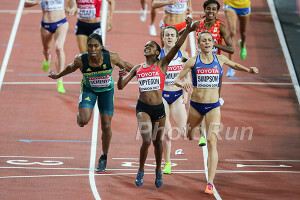 Simpson, however, once again measured her effort perfectly and used her trademark strong final 100 to move from fourth to second in the final straight and run down yet another medal. Friend of LRC Cathal Dennehy made an interesting point in the mixed zone after the race. He noted that if you lined up everyone in tonight’s field in an 800, 1200 or even a 1500 time trial, there’s a good chance Simpson’s time wouldn’t be in the top four or five in any of the three events. Yet time and again at global championships, Simpson has beaten people she shouldn’t have if you go by what they’ve done on paper. Simpson may only be #3 on the all-time U.S. list at 1500 (3:57.22), but she is far more decorated than the two women ahead of her. Shannon Rowbury (3:56.29) and Mary Decker (3:57.12) have combined for two World Championship/Olympic medals at 1500 (one gold, one bronze). Simpson has four (one gold, two silver one bronze). America has never produced a better female 1500 runner. The world hasn’t produced many better championship 1500 runners either. Simpson’s medal made her just the second woman in history to win four in the 1500, after Algeria’s Hassiba Boulmerka, (3 gold, 1 bronze). 1500 runners face a number of split-second decisions in the course of the race, and their choices often have just as big an effect on the outcome as their fitness. Tonight, Kipyegon and Hassan both kicked hard from 300 out, but in battling each other for the win, they ran the risk of being run down by the rest of the field in the home stretch. Kipyegon managed to hold on, but Hassan could not sustain the hot pace all the way to the finish line and wound up out of the medals. Muir cost herself a medal last year in Rio by responding too soon to Dibaba’s big move midway through the race, and this time around, she showed more restraint as she did not go with Kipyegon and Hassan immediately when they started throwing haymakers. However, on the backstretch, she got antsy and made a move of her own, passing Simpson in an attempt to run down the leaders. 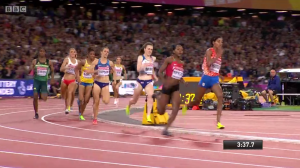 Additionally, when the racing really started with about 500 to go, Muir could have stayed in the pack on the rail and run behind Simpson, but she didn’t want to be boxed mid pack and got antsy, moved wide and moved up on the outside. As a result, she had to run extra ground on the first turn of the last lap. Had she not done either of these things, she almost certainly would have run .08 faster and medalled. 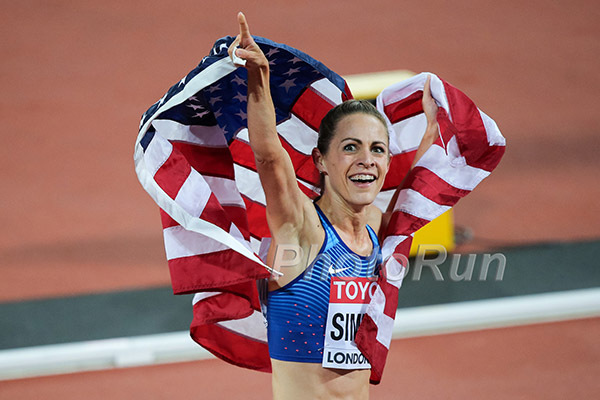 Simpson, meanwhile, has developed patience and an innate understanding of her body’s capabilities in a decade of world-class running (Simpson, who turns 31 in two weeks, made her Worlds debut in 2007 in Osaka in the steeplechase) and as a result knows exactly how hard she can push, and from how far out. Jenny, we think you just did. Simpson is a former world champion and won an Olympic medal last year in Rio, but you wouldn’t know it by her reaction tonight. 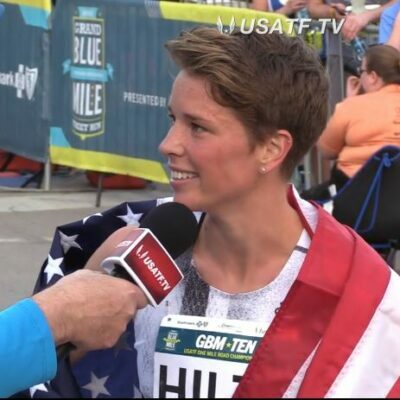 Upon seeing that she medalled on the scoreboard (Simpson initially thought she was either second or fourth even though she said that made no sense), she took off on a sprint around the track to grab a flag. 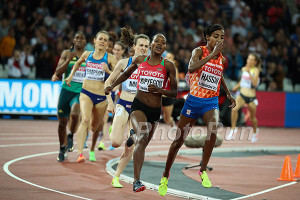 The women’s 1500 has seen some very dirty races in years past, none more so than the last championship final run on this track in 2012, where four of the top nine finishers — including the top two — have been disqualified for doping violations. Simpson knows that doping is a problem the sport still faces, but that she cannot allow that to prevent her from coming out and giving it her all. “If I’m second in this race, you beat cheaters. Because there’s not zero cheaters in the race or zero cheaters in the world, right? And so that feels amazing. 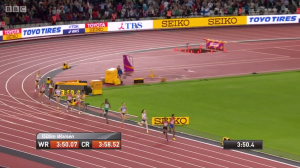 Before Worlds, Caster Semenya had run one 1500 in her life under 4:10. 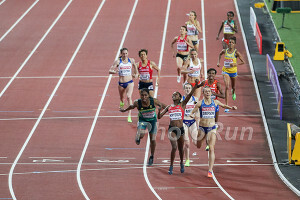 Nonetheless, she decided to take what she called “a gamble” and take on the world’s best at 1500. 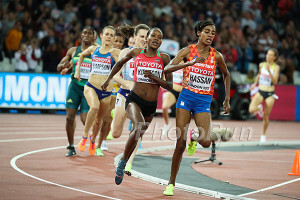 It paid off for her as she’s the World Championship 1500m bronze medallist and thinks she can do better in the future. 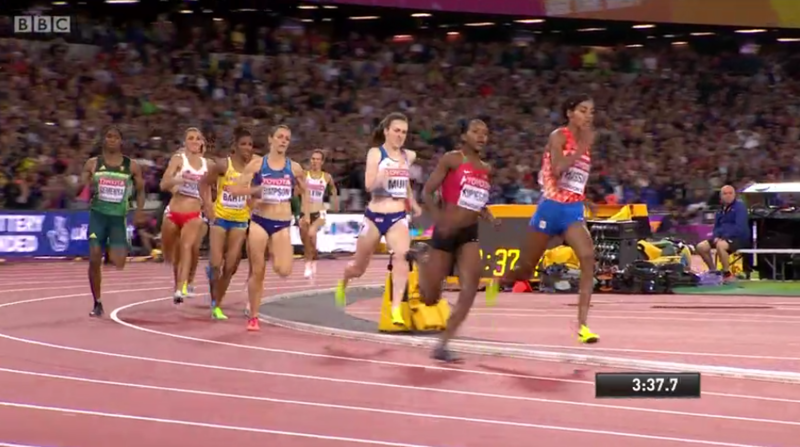 That may be a strong possibility, as tonight Caster made tactical mistakes, but she still had the best final 300m of the final and left with the bronze medal, only .31 away from the gold. 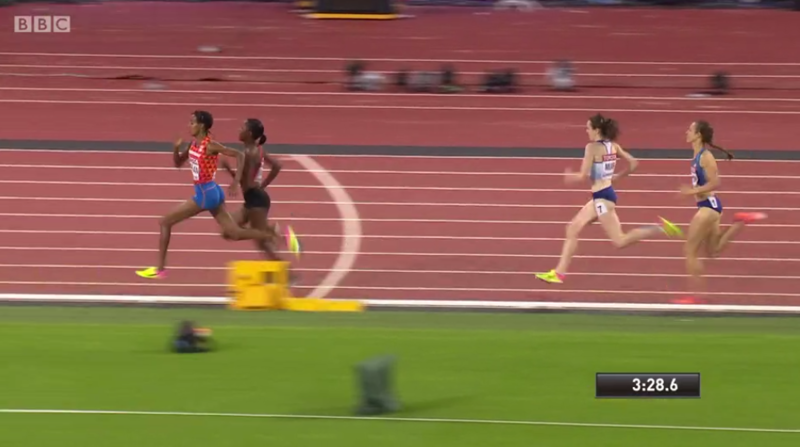 It was close at the line (she beat Laura Muir by .07 for bronze) so she had to dip. “Dipping is always the case. If you want a medal, you have to dip. I didn’t dive, I dipped but if you don’t have balance you fall,” she said of the tumble to the track at the finish. The big question for Caster is whether she is allowed by the IAAF to run in the future without suppressing her testosterone. 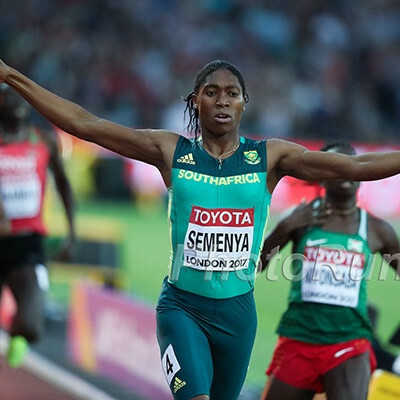 The Court of Arbitration in Sport could rule the IAAF can implement testosterone limits for women’s competition and that likely would severely limit Caster’s prospects on the global stage. “It’s (the hyperandrogenism issue) been the lyrics since 2009. When you listen to music and have one song playing each and every time, it’s been almost nine years. It’s quite boring. For me I have no time for that,” she said. One thing is certain for Semenya: in terms of competition, she’ll be allowed to compete in the 800m here, where she is the favorite for gold. She said the medal in the 1500 should help her in the 800. Caster at the press conference warned the other medallists that she wants to run more of the 1500 and they had better watch out for her. 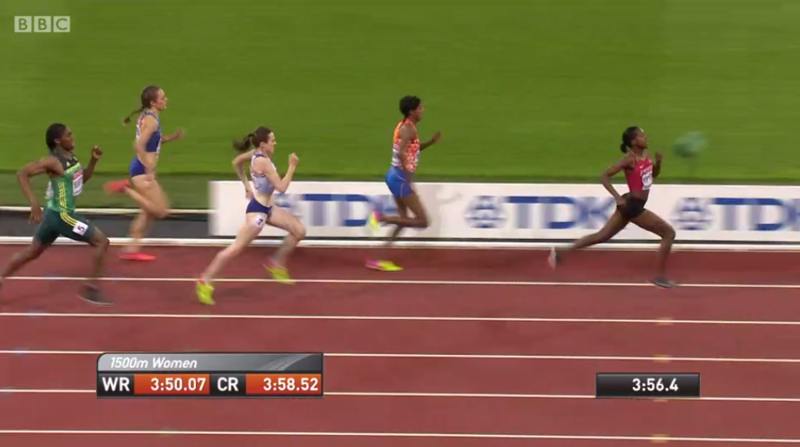 Individual video below with Caster first and then the full press conference where you can see Caster tell the other 1500 medallist to look out for her because she wants to keep running the 1500. We at LetsRun.com have been pretty outspoken that Caster should not be allowed to run without suppressing her testosterone, but if you just watch the clips below you’ll see how on a personal level we find her very impressive. 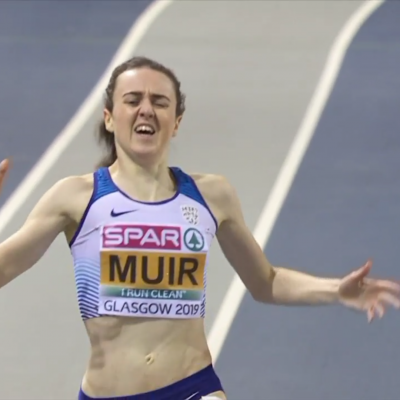 Muir’s tactics in this race will likely be dissected ad nauseam (actually they already are being dissected) in the British press as many had expected a medal from her tonight. She certainly made some interesting decisions, taking the pace out hard before slowing way down on the second lap and then making a move that ultimately proved to be a little too much, too soon with just over 200 meters to go. No one can question Muir’s guts, but once again, by running for the win, Muir likely cost herself a medal. It can be a hard thing to restrain yourself as athletes pull away from you, but had Muir employed Simpson’s approach — run a more even pace and get yourself to the finish line as fast as possible, even if it means letting someone break away — there’s a good chance she would have medalled either tonight or in Rio last year. But letting someone go when every urge is telling you not to is easier said than done. Like Prefontaine, it’s not in Muir’s DNA to back away from a challenge. As for being pipped for a medal by the controversial Semenya, Muir did not want to address the subject. “I’ve not got anything to say about that,” she said. While Muir’s tactics are debatable, Hassan’s are not. She went too hard too early, and despite sitting in second place with 30 meters to go, Hassan ended up out of the medals. 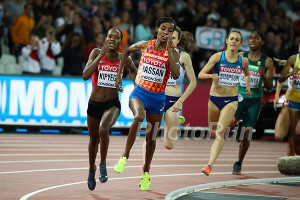 Hassan was so preoccupied with racing Kipyegon that she forgot about the rest of the field and paid for it at the end. For most people, fifth in the world isn’t bad, but when you’ve dominated the world all year long — Hassan has the top three times this year — it’s a major disappointment. Hassan is still only 24 years old, so her future remains very bright. But you only get so many chances to win a world title when you’re super fit, and Hassan blew one tonight.